We are blessed to be served by a talented and dedicated staff. The staff of Lutheran Church of the Good Shepherd includes paid professionals as well as gifted and faithful people who serve on a volunteer basis. We are grateful to all of them for their faith and commitment. Pastor Russell is responsible for leading staff and other congregational leaders in defining and furthering the mission of God's church in this place. Pastor Russell oversees the committees and task forces that carry out that mission. Pastor Russell shares in the ministries of preaching and presiding at worship, hospital visitation, homebound communions, pastoral counseling, and teaching. Pastor Russell received a M.Div. from the Lutheran Theological Seminary at Gettysburg. 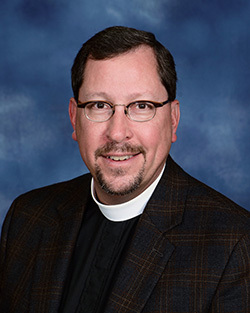 He began his ministry at Good Shepherd in 1994, being called as Associate Pastor. He became simply "Pastor" in 1997, and Senior Pastor in 1999. He previously served a parish in the Northeastern Pennsylvania Synod of the ELCA. Having been raised in Lancaster County, coming to Good Shepherd was a bit like coming home. He and his wife, Denise, enjoy the outdoors as well as their three grown children – two living and working in Pittsburgh, and another in Bethlehem, PA.
Christopher Prestia began his musical training at the age of six in Garland, Texas, studying piano under Kathy Pratt. 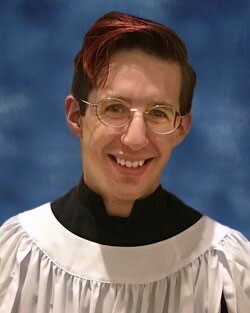 After relocating to Wantage, NJ, he discovered his love for the organ when he accepted his first position as a church musician in October of 2004. After beginning formal organ lessons with John Baratta in Newton, NJ he decided to make sacred music his life's work. Christopher completed his Bachelor’s degree in Organ Performance with Mark Laubach at Marywood University in Scranton, PA. While at Marywood he also began his vocal and choral studies under Sr. M. Alphonsa Concilio and Dr. Rick Hoffenberg. Christopher continued on to study Organ Performance, Sacred Music, and Choral Conducting at Indiana University under Janette Fishell, Bruce Neswick, and Dominick DiOrio, respectively. Since then his career has taken him to serve parishes in Central Pennsylvania and New York City. Christopher also maintains a studio of private music students, using an approach that emphasizes skills that can be applied equally to music and everyday life. In his spare time Christopher enjoys architectural design, cycling, wellness, cooking, and learning about the Victorian and Edwardian eras. 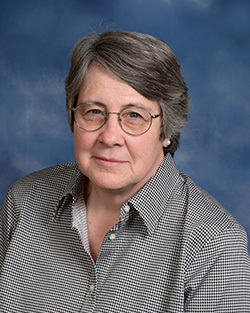 The Parish Secretary assists other staff and leaders in their work, through records management, publications, mailings, and daily supervision of the church office. Kathy is the first person you will encounter (either by voice or in person) when you call or stop in at the church office. Kathy came to us in 2007, and is a valuable member of the staff. She lives in the Leola area with her husband, John. Grown children and growing grandchildren bring her joy. She also enjoys gardening, soap making, photography, and her Chevy SSR. Kathy grew up in York, PA and is a graduate of Boston College's School of Nursing. She has worked as a neonatal intensive care nurse for over 40 years, serving for more than 25 years now at Penn State Hershey Medical Center. She also serves the congregation as a communion deacon, assisting minister, and participant in the prayer shawl ministry. Kathy serves as godmother for more than 20 kids, some of whom are now adults. She enjoys reading, history, building dollhouses, quilting, cross stitch, and scrapbooking. She especially enjoys visits to Williamsburg, Virginia. Bob is responsible for cleaning the building on a regular basis. Come and visit us and you will see the results of his work. He and his wife, Joan, have two daughters and four grandchildren. 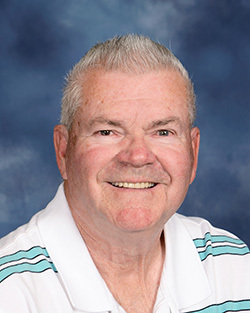 Bob is retired and enjoys golf and NASCAR racing.